This project involved restoration of an abandoned gravel pit excavated below groundwater, and enhancement of the aquatic resources. One small stand of Japanese knotweed was also eliminated. The Nature Conservancy owns 1,700 acres known as the Basin Preserve. 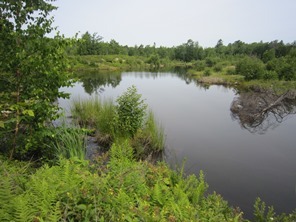 At the time of acquisition, the Conservancy inherited an abandoned gravel pit where extraction below groundwater level resulted in four year-round pools; no attempts were made to restore the pit at the time of abandonment by the prior owner. The abanoned pit covered approximately 7-acres and consisted of barren soil around old roads, four ponds totaling approximately 1.1 acres, primarily old field vegetation, and stockpiled overburden of sand and gravel with limited organic matter. The pit was also being accessed by unauthorized motorized vehicles, resulting in soil erosion and damage to the limited natural vegetation. The project involved redistributing the stockpiled overburden to better match the existing topography, stabilizing an eroding outflow from the largest pond, creation of pit and mound features, revegetating the site with both upland and wetland vegetation to improve both habitat and water quality within the existing ponds, and using boulders available on-site to block access to motorized vehicles.